This southern outlier of Caherbarnagh overlooks the upper reaches of the Clydagh Valley. Knocknagowan is the 352nd highest place in Ireland. Start at the track to Shrone at W145 840 A where there is room to park 4-5 cars. Follow the track for approx 600 mtrs and turn off it onto a track that is not marked on the map , it looks like the farmer has constructed it in the last few years. This track allows you to gain some height (100 mtrs approx.) before you strike out across open mountain(or should that be bog). 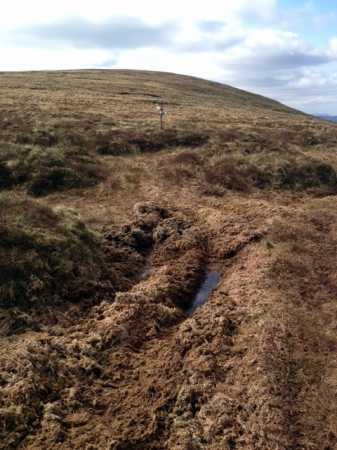 The summit of Knocknabro East is gained by a hard slog over rutted ground with very wet conditions underfoot. From the summit head for Knocknagowan.This is a 3km trudge across bog, full of holes, covered in knee-high heather and energy sapping long coarse grasses. Picture from thomas_g : Too 4x4 by far? Picture: Too 4x4 by far? Parked at W17988 83662 D, room for one car (just) in what looks like an old shed. If you've got more than one car (not that I'm suggesting that you can drive more than one at a time) there is room for about 6 cars at a forestry entrance at W17252 83903 E.
I headed a few hundred metres further down the valley to a gate, went through and headed straight up for the summit along the line of a fence. Despite nearly 2 weeks of dry weather and record temperatures in March, it's still a boggy slog with alternating tussocky grass and bog holes, I can't imagine what it's like in the depths of winter. I was disappointed to see some 4x4 damage between Knocknagowan and Caherbaragh, I will admit I did enjoy the few minutes respite gained by following the tracks though. Nice views over the Clydagh valley (if you like wind turbines) and the Paps looked well in the distance today. I continued straight on to Caherbarnagh (see my comments there).